Russell Field is a core instructor at Alderleaf. 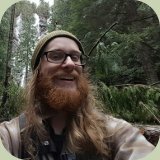 He is a graduate of the Alderleaf Wilderness Certification Program, the Advanced Wilderness Skills Program, and the Advanced Wilderness Instructor Apprenticeship Program. He holds a Permaculture Design Certificate and is certified through CyberTracker Conservation International as a Level II Tracker (Level II Track & Sign Certificate and Level II Trailing Certificate). Russ has always been interested in the native animals and plants of Western Washington, having grown up in south Snohomish County. He is an avid outdoorsman and spends lots of his time in the forest hiking and climbing. Russell is a well-rounded naturalist with an emphasis on bushcraft, traditional skills, and habitat restoration. Flintknapping stone tools and primitive hunting are his main focus. He enjoys pretty much anything that involves sticks or rocks.